Endurance Vehicle Protection, the nation’s only direct-to-consumer provider of extended vehicle protection, commonly referred to as an extended auto warranty, took home the top honor for Best Website of the Year by the Golden Bridge Awards. By providing them with the information they need on a website that is visually pleasing and easy to navigate, it is no wonder why user-determined metrics have improved and we were awarded Best Website of the Year. 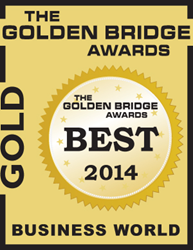 Endurance has earned the prestigious Gold Award for Best Website of the Year at the 6th annual 2014 Golden Bridge Awards. The coveted annual Golden Bridge Awards program encompasses the world’s best in organizational performance, innovations, products and services, executives and management teams, product management, and customer satisfaction programs from every major industry in the world. Organizations from all over the world are honored including public and private, for-profit and non-profit, largest to smallest and new start-ups. Ever since the company’s inception, Endurance has set out to conquer the vehicle protection industry by providing customers with the highest level of coverage at the most economical price. Endurance’s customer-driven efforts were most recently noted by a win for Best Customer Service Department of the Year at the 2014 American Business Awards. In addition to this already impressive list of accomplishments, Endurance is also the only direct-to-consumer provider of extended vehicle protection that is both A+ rated by the Better Business Bureau and Gold-Certified by the Vehicle Protection Association. More than 40 judges from a broad spectrum of industry voices from around the world participated and their average scores determined the 2014 Golden Bridge Business Awards winners. The winners were honored during the awards dinner and presentation on September 8, 2014 in San Francisco attended by the finalists, industry leaders, and judges. Founded in 2006, Endurance Warranty Services LLC strives to be the most customer-driven company in the industry and believes that protecting consumers from exorbitant repair bills is the key to their success. Endurance is the only company industry-wide that is both A+ rated by the Better Business Bureau and Gold-Certified by the Vehicle Protection Association. Endurance is also the top-rated vehicle protection provider by TopTenReviews.com. By delivering unparalleled customer service to every customer we reach, current or future, Endurance continues to reign as the premier provider of vehicle protection in the nation. Visit Endurance online at http://www.EnduranceWarranty.com. The Golden Bridge Awards are an annual industry and peers recognition program honoring best companies in every major industry from large to small and new start-ups in North America, Europe, Middle-East, Africa, Asia-Pacific, and Latin-America, Best New Products and Services, Best Innovations, Management and Teams, Women in Business and the Professions, Case Studies, Customer Satisfaction, and PR and Marketing Campaigns from all over the world. To learn more about The Golden Bridge Awards, visit them at http://www.goldenbridgeawards.com.